I have two fall trips lined up. 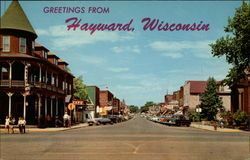 Both to Hayward,WI. Or.. Cable and Seeley,WI to be exact. On Oct 18th thru the 20th, yes, thats a Tuesday thru Thursday, I’ve been invited to a Trek Ride Camp in Cable. Just a get together of dealers to hang and ride. Trek will have some bikes to demo but they stressed to bring your own. Besides, what could I possibly want to demo when Im already riding the coolest bike out there. There’s a chance my EX will be Di2 by that time and would make it the coolest bike alive. Just waiting for the XT Di2 to hit. But if its fashionably late like most of the bike stuff in this world I’ll lose my patience and just go XTR. Either way the bike will be awesome. I’ll be the talk of the campfire. Most will be camping at the new Birkie start area but Im going to be staying at my usual motel in Seely, about 7 miles away. Day rides, nite rides and campfires. I won’t know anyone there but a few but Im sure I’ll be fine. And I know Im big and slow so I would have no problem riding alone. Im kinda used to that. I just might bring Pinkie out too for maybe a gravel ride ( if its done). That would be fun. Another Hayward adventure with a few of the guys on November 10,11 and 12. Staying at the same place (Lenroot Lodge) and again fill three days with riding. This time besides the woods we might try and incorporate some gravel also. The locals can hook us up with some amazing gravel routes up there. But mostly in the woods. Its close to the middle of November so snow is not out of the question. That would be an awesome weekend if they had snow. And still, Marquette for a quickie at some point. This weekend for the Enduro has now been ruled out but maybe sometime this fall. I would love to hit a high point there and see the colors. The other two trips are set in stone and I still need to work on Marquette. Either way Im looking forward to this fall. I have good help in the store. Last nite I brought the EX home to get in a ride this morn before work. But it was one of those mornings where it was so dark and hard to get up so I decided to not ride. And of course I kinda felt bad about that until the rains came and took me totally off the hook again. But I dont really feel any better. I have the new oval chainring on and want to ride it. And it looks like rain all day and all day tomorrow. In fact the entire weekend looks like crap with maybe a break on Sunday. This weekend is the local MTB race that has been a mainstay here for years. I was the director of that race for awhile many years ago but since has stepped back from it. I might show up a bit on Sunday to watch. Maybe. Better chance I will just go for a bike ride now that I have Sundays off and the weather looks pretty good. Get outside and have a great weekend.